The community of Churchill is located at the estuary of the river of the same name, 965 kilometers northeast of Winnipeg in the southwest shore of Hudson Bay. Initially land of hunters, explorers and adventurers, with the arrival of the train in 1929 became an active port to send grains for Europe. After the Second World War started in 1942, the United States Air Force -with Canadian approval- built an airport there. Its main function was to strengthen and safeguard the vital intercontinental air routes, a task for which Churchill had a strategic geographical position. After the war, Canada bought the facilities back, mainly to safeguard its sovereignty and the control of the base which from that moment would be operated by the Canadian Department of National Defence. During the first years of the Cold War, the airport was a key factor not only in developing much of the isolated towns and bases in the Arctic, but also played an essential role in building the mythical DEW line (Defense Early Warning) conformed by several surveillance radars and observation posts which served as an advanced defence against a potential Soviet attack coming from the north pole. Those years marked also the start of the balloon launch activities in the area. The closeness of Churchill with the north pole and the high geomagnetic latitude where it was located gave special interest for those branches of science trying to unravel the enigma around the cosmic radiation. The first scientists to make these launches were from the Bartol Research Foundation, affiliated at that time at the Franklin Institute whom in conjunction with the National Geographic Society organized an expedition to Churchill with the aim of launching balloons carrying emulsion plates and instruments for measuring cosmic rays. These flights were acomplished using huge "trains" of several neoprene balloons flown in tandem during the summer of 1952. In 1957 was established 16 kms south of the base, the Fort Churchill Rocket Range, one of the first sites used to launch scientific rockets in the world and the only of its kind in Canada. During the International Geophysical Year (IGY) were launched from there several rockets instrumented to study the space geomagnetism and the Northern Lights. 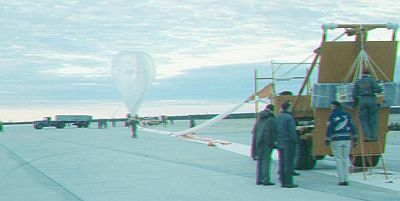 In early 60's, started an annual program aimed to launch huge stratospheric balloons under the auspices of the "Skyhook" program from the Office of Naval Research (ONR), of the Navy. These launches known as "Skyhook Churchill" were carried out each year for more than a decade. The continuity of the balloon flights along so many years had its origin in two fundamental factors: the aforementioned location of the site from a scientific point of view and the highly developed infrastructure available. The presence in the area of a major military base (Fort Churchill), coupled with the rocket launch complex and the huge airport offered logistics support unthinkable elsewhere. Additionally, the railway development, allowed the efficient movement of heavy equipment throughout the year without relying on expensive air transportation or the sea routes which where usable only when the Hudson bay was free of ice. Each campaign started in the early summer, not only because of weather issues but mainly to allow the thawing of the thousands of lakes scattered by the Canadian tundra which were used for landing the seaplanes used in the search and retrieval of payloads. Generally, the launch window was closed in mid-August. 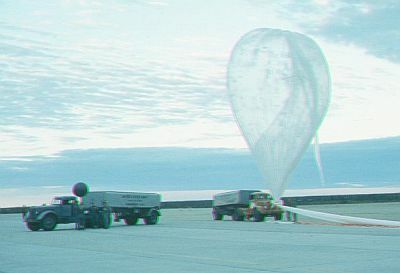 No balloon was launched after that date because as stratospheric winds began to change its direction, the balloons would move westward over the Ocean. Each campaign was very intense and involved between 15 and 40 flights, not only from the local airport, but also from several isolated villages and towns scattered throughout the tundra. One of them, Uranium City -located on the north shore of Lake Athabasca- was the center of operations for the rescue team in charge of the search and recovery of the payloads. For this task, they had an helicopter and two seaplanes: while one of the planes followed the gondola while falling under his parachute and marked the landing place, the helicopter located the payload and transported it aside a lake, where the other seaplane landed picked it up and transported it back to Uranium City. Once there the cargo was shipped aboard a C-47 "Dakota" back to Churchill. The "Skyhook" campaigns were carried out every summer until the last one in 1975, and performed experiments in several scientific fields, mainly for NASA, Navy's ONR and several US universities . Although since the end of the Skyhook flights have not been launched other stratospheric balloons from there, in recent years took place some isolated experiments using small balloons. These later experiences were carried out by the Physics Department of Dartmouth College. 8/12/1964 3:28 utc + 41 h SCINTILLATION COUNTER Failure of the termination system. Payload never recovered.